Featherstone's players celebrate Ian Jackson's try in Saturday's cup tie against Rochdale Mayfield. Picture: Matthew Merrick. Division One side Featherstone Lions had no complaints after losing 39-28 to higher-ranked Rochdale Mayfield in Saturday’s Conference Challenge Trophy semi-final at the Mill Pond Stadium. Premier Division Mayfield seemed a lot quicker than the home team and had the game virtually wrapped up at half-time when they led 20-6. Tireless worker Josh Hardcastle was Featherstone’s stand out player while Dean Gamble, Ian Jackson and Gaz Gale also impressed. Mayfield went ahead with a converted try after intercepting a Lions pass and they quickly doubled their lead after the ball went dead from Featherstone’s restart. Despite the efforts of Hardcastle and Brendon Gibbins, the visitors scored again to lead 16-0. Featherstone rallied and Gamble’s chip to the corner saw Anthony Yates go close. Gamble then went over for a try that Ian Jackson goaled to open Featherstone’s account . 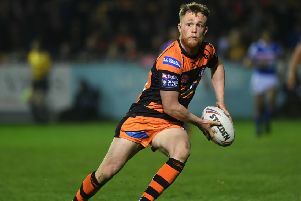 The home side lost in-form James Kitchen for a spell with a nasty mouth injury before Mayfield struck again shortly before half-time to increase their lead to 20-6. Lions were well below par in the first half and their completion rate was poor. Player-coach Jamie Rooney made an excellent run early in the second period before Gale’s slick pass saw teenager Jacob Jowett finish in style wide out. However, Mayfield then increased their lead with a drop goal and continued to apply sustained pressure. Lions hacked the ball dead from a Mayfield kick but the home side were caught out by another kick that led to a converted try at the corner. Gale and Danny Glassell had tilts for Featherstone before Jackson’s solo try and conversion gave them hope. Featherstone then cut the deficit to five points when Gamble’s astute pass saw Davi Garahan go over and Jackson converted. From the restart, Mayfield got possession from a Lions knock on and they made the home side pay dear as they scored a game-breaking try. They soon scored again to make it 39-22 and put the game beyond Featherstone’s reach. Lions continued to plug away and Hardcastle scored a well-deserved solo try that Jackson improved to complete the scoring. If Featherstone are to stay in the Division One promotion race, some of their players will need to start playing better. Lions visit Hunslet Warriors this evening (Thursday, 7pm) in a re-arranged league match.